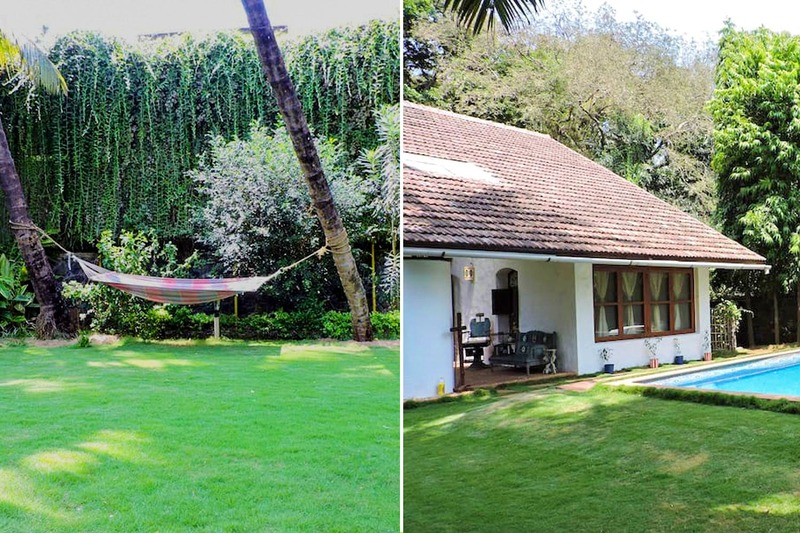 If you’re looking for the perfect place to unwind over a long weekend or just want to do your own thing, Serenity villa in Alibaug is a great place to begin. Located in a quiet village, you can wake up to birds chirping in the morning, head out for a quick swim in their gorgeous pool, have a barbecue or even sit out and catch up on your favourite book. Alibaug is around two and a half hours from the city, so you can take a ferry (closed during monsoon) from the Gateway of India to Mandwa jetty and then take an auto or local transport from there, or you can just drive down to Alibaug and head straight to the villa. Please note that since it’s an Airbnb property, you will only get to know all the address details after your booking is confirmed. It’s a rustic cottage with a host of amenities to keep you entertained and occupied. There’s a covered patio that you can enter from one of the bedrooms on the top floor. They also have a lovely garden and a swimming pool, and even a hammock just by the pool for that perfect afternoon laze. You have the option of eating in the garden, the patio or even the sit-out area near the pool. You can also get to cook your own meals or ask the staff to cook for you. The staff services are complimentary. Plan a peaceful holiday away from the city blues and indulge in some me-therapy. The villa has three bedrooms, and can accommodate up to 6 guests. Currently, the price on Airbnb is INR 10,000 per night. Disclaimer: Please note that the prices and other information were available to us at the time of writing this article. In case there’s a change, please do contact the owner or concerned persons who can take it forward.